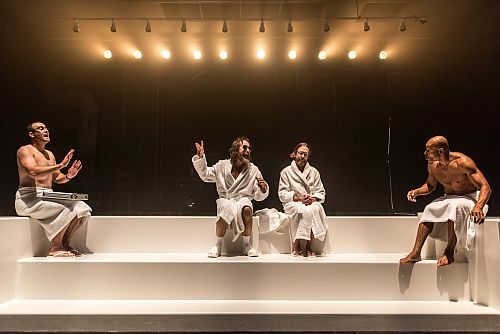 If I were giving a prize for the funniest, darkest opening scene in a play I’ve seen this year it would go to Crow’s Theatre production of A&R Angels, playing at Streetcar Crowsnest. A man (Gordon S. Miller who is terrific as two “suiciders”) walks into a room, drinking a Slurpee. He finishes the drink, puts the cup on a table, climbs on a chair, and slips a noose around his neck. Enter the angels! And the roadies and sound equipment. They’re here to play a song that will make the “suicider” change his mind and decide to live. They have 22 hits to their credit but their past 10 attempts have all been misses. Loud Angel (Kevin Drew, the playwright and Broken Social Scene frontman) is full of doubts, wild ideas, and unfinished thoughts. His partner, Soft Angel (Ben Kowalewicz, frontman of Billy Talent), is the voice of reason, praising, cajoling, pleading. The song doesn’t work. They’re 11 down with two chances left before they have to go back to earth as ‘mentors’. They meet in a sauna with the A&R boss (Maurice Dean Wint) and the numbers guy (Graham Cuthbertson). Loud Angel wants a better kind of “suicider”. The others try and find a way to make a better song with the numbers guy citing stats about what key is most effective and the A&R boss and Soft Angel discussing how many verses there should be before the chorus and whether there should be a pre-chorus. Loud Angel would drive me crazy in real life. He keeps resisting suggestions, doesn’t want to try anything new and and doesn’t want to go back and try the things that worked in the past. It’s not hard to figure out that number 12 isn’t going to work and that number 13 will. Ngozi Paul is the 13th suicide. She and Loud Angel have a history although it isn’t what I expected. She was his muse. She makes a suggestion, the song works. I found the ending a bit low-key given the fast pace of the rest of the play. Some catharsis would have been nice. It would have been lovely if the closing scene had been as strong as the opening. Having said that, the play is darkly funny. The question of whether a song can still reach people and affect them deeply in a digital age where we are all connected but disconnected is important and applies to more than music. My friend Pat wondered if there was an argument being made that there’s a formula for a successful song. We both thought the acting was terrific. I was particularly impressed with both Drew and Kowalewicz. They both have years of experience being on stage but it’s different playing the same character night after night. Director Chris Abraham really gets the best from the cast. Julie Fox’s set ranged from a minimal white sauna to a grungy hotel room to cozy apartment. There were major set changes but they were done so discreetly that I didn’t notice them at all. One of the other things I loved was a tiny detail in Fox’s costume design. Wint’s towel in the sauna scenes had a pocket. I also loved the visual of Cuthbertson wearing a toweling robe and carrying an aluminum briefcase. Kimberly Purtell’s lighting was very big. It reminded be of concert lighting but on a smaller scale. The same with Thomas Ryder Payne’s sound. Drew is a very funny writer, I hope he continues to write plays. I thoroughly enjoyed A&R Angels. It’s definitely worth going to see.